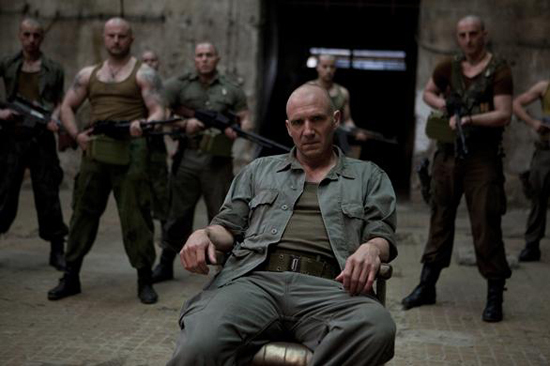 The International Trailer for Ralph Fiennes' Directorial Debut 'CORIOLANUS' Arrives! Lionsgate have released the first trailer for Coriolanus. Ralph Fiennes will be starring in and making his directorial debut with the film, a contemporary interpretation of Shakespeare‘s tragedy of the same name. Also starring Gerard Butler, Vanessa Redgrave, Brian Cox, Jessica Chastain & James Nesbitt, the movie opens in the US on December 2nd & in the UK on January 20th 2012. Hit the jump for the trailer & details. Synopsis: "Caius Martius ‘Coriolanus’ (Ralph Fiennes), a revered and feared Roman General is at odds with the city of Rome and his fellow citizens. Pushed by his controlling and ambitious mother Volumnia (Vanessa Redgrave) to seek the exalted and powerful position of Consul, he is loath to ingratiate himself with the masses whose votes he needs in order to secure the office. When the public refuse to support him, Coriolanus’s anger prompts a riot which culminates in his expulsion from Rome. The banished hero then allies himself with his sworn enemy Tullus Aufidius (Gerard Butler) to take his revenge on the city." I'm reading: The International Trailer for Ralph Fiennes' Directorial Debut 'CORIOLANUS' Arrives!Tweet this!